According to the fruit of his doings." if approved by voters this proposition would require both a waiting period and voter approval before CodeNEXT or any subsequent comprehensive revisions of the City’s land development laws becomes legally effective. 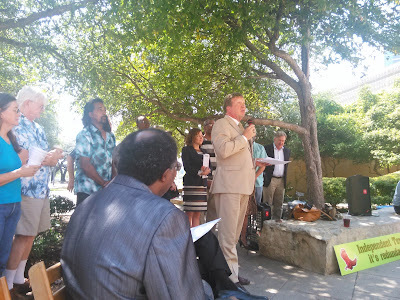 In addition, no land development entitlements would be granted or vested under such new laws until June 1st following the next regularly scheduled council elections after the City Council adopts CodeNEXT or the comprehensive revisions. Council members serve four-year staggered terms, and council elections are held every two years in November. The purpose of the waiting period is to ensure that voters have the opportunity to learn about the proposed changes and elect council members who then have sufficient time to amend or reject the prior council’s adopted changes before they go into effect. After the waiting period, the changes would not go into effect until Austin voters approve the laws at the next available municipal election. Should voters not approve the new laws then the existing land development laws would remain in effect. The group is also circulating a second petition that would make it significantly easier for voters to reverse policies enacted by council. And it's here that we need to make a disclosure: While we had nothing to do with the planning of this campaign or yesterday's event, this author was LITERALLY the first person in the entire city to sign the CodeNext petition (we were the second person on the other one). Here's why: Based on everything we've seen to this point, it appears to us that CodeNext is headed towards a last minute cram down in the spring. We don't think anything good can come from that process. And that's why we want the city to take the final draft to the voters. Right now, it appears that CodeNext is being drafted by a tight circle consisting primarily of the consultants, the city bureaucracy, and the Mayor's office. We don't trust any of those groups. Thus, we want the voters to have the final say. Obviously, we have our opinion about what we'd like to see out of CodeNext. But this petition drive isn't about the specific contents of the final draft. In the event that this petition drive is successful, it's virtually guaranteed that's its various organizers will end up on the opposite side of the resulting referendum. It's been argued by those with whom we are in closer alignment over the final outcome that this petition campaign is a smokescreen to kill the whole thing. It isn't; it's an accountability measure to make sure ensure the final draft actually serves the public. That being said, if the final draft does little more than serve the usual suspect special interests...then you're dadgum right we want to be able to kill the whole thing at the end. Put differently, we would prefer to avoid this situation. Bottom Line: Only a crazy person would trust the current council to come up with something good without this additional accountability mechanism.